One of the “most respected” names in the industry. As people look for new ways to invest, binary options have grown in popularity. The reason for the growth is due to the low cost of entry, meaning minimum balances can be low. Secondly, it offers exposure to markets that otherwise would be unattainable to many due to margin requirements and geographical location. That being said, this article will be an overview of Binar.com, which as you can gather from the name is a binary option-trading platform. 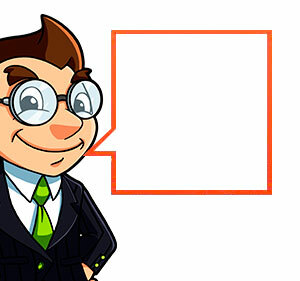 We’ll cover all of the important details and anything that will help you to formulate an opinion. According to the company’s website, Binary.com was founded in 1999. With an established name in the marketplace, they have become one of the “most respected” names in the industry. Their four values include integrity, teamwork, competence, and customer focus. Beyond that, Binary.com is a platform that allows for binary options trading over a variety of assets, as well as utilizing MetaTrader 5 for Forex and CFD’s. With their wide selection of products and use, odds are you will find something that can accent your current portfolio and trading style. Binary options are built off the premise of a defined risk product. Before you execute the trade, you will know what your max gain and max loss will be. From there, there are several ways a platform can build these products. With Binary.com, there are several different products such as Rise/Fall, Higher/Lower, Touch/No Touch, and many more. The different products require the market to do certain things in order for the option to pay out, allowing you to find the right product to fit your needs. 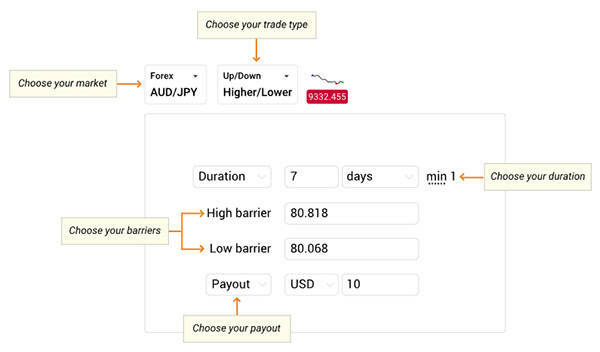 Also, there are CFD’s that can be used with MetaTrader 5, allowing for an additional layer of choices. While CFD’s are different than binary options, this platform allows for their use, which can compliment any portfolio. As with many binary option trading platforms, some are lacking in reliability. Many people new to the binary option world can be hesitant and rightly so, as you are depositing and trading with a company. Trust needs to be built and Binary.com appears to have done a good job ensuring investors they are properly covered. 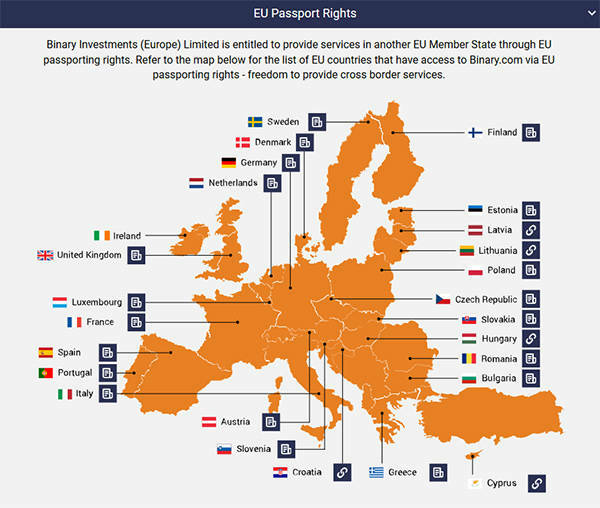 On their website, they have a detailed page listing how they are regulated and what countries they are covered in. Also, they clearly state which countries are unable to open an account with Binary.com. From how it appears, this company does a solid job of divulging as much detail as possible to ensure their investors and traders are informed. When deciding what client to use, one of the first items many consider are the various account options. The other item to consider with Binary.com is they also utilize MetaTrader 5 so you will likely need to access their platform to trade certain products. There are two different accounts with the first being a demo and the second being a live account. The importance of having a demo account can’t be overlooked as this gives you a chance to test drive the platform without risking any capital. To go along with the accounts offered on the platform, there is the MetaTrader 5 platform you can utilize as well. According to the Binary.com website, there are three MetaTrader account types. 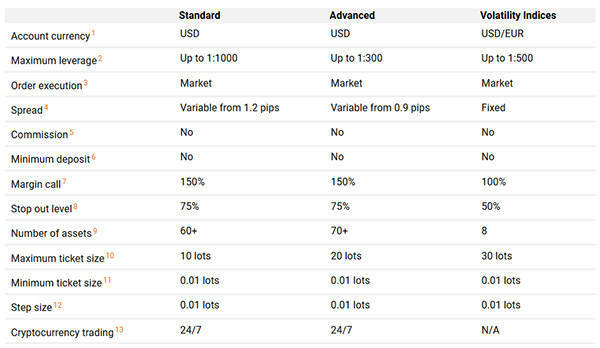 First is the standard account, which “is suitable for a wide range of traders, both new and experienced”. From there, you can upgrade to an advanced account, which provides tight spreads and higher tick sizes. Lastly, there is the volatility indices account that allows you to trade CFD’s on volatility indices. Between these types of accounts, odds are one of them fits your needs. The bonus to these accounts as well is according to their website, there is no minimum deposit required for a Binary.com account. When searching for the right trading platform, it is important to know what assets you can trade and have exposure to. The goal is to have a wide variety that fits your portfolios needs. According to the Binary.com home page, you can trade Forex, Crypto, CFD’s, Metals, and Look backs. If you want to know the full list of markets available, you can visit their asset index page. As you would guess, they have many of the major currency pairs that include USD/JPY, EUR/USD, GBP/JPY, and AUD/JPY. 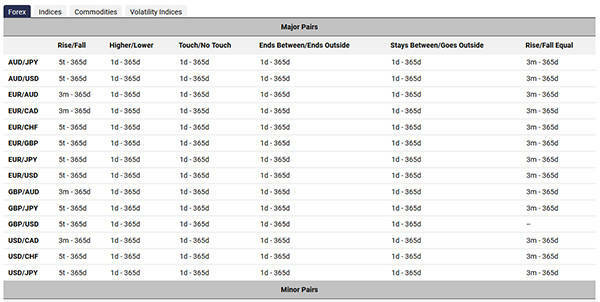 From there however, you can go into what they categorize as ‘minor pairs’, which include AUD/NZD, USD/MXN, and USD/SEK. With the various indices, it includes the world’s major indexes and few smaller ones as well. You should have no problem trading indices if that is your goal. Lastly, the different types of commodities include gold, palladium, platinum, silver, and oil. As you can see, there is clearly no shortage in asset options, which is a huge plus for you the trader because you can access these markets all from one platform. Certainly when it comes to searching for the right binary option platform, there are several out there as this industry has surged in popularity The first item many seek out is their reputation and Binary.com does a great job of showing their award winning trade excellence, providing comfort and building trust in their traders and users. For a full list of their awards, you can view the why us page at Binary.com. However, a few of their awards include “Best Fixed Odds Firms 2021” and “Best Binary Option Broker” by Online Personal Wealth Awards 2017. One section of a financial platform you need to consider is their education section. The firm you choose to invest with should provide you with continued education as the market change and update. Education allows you to stay up on current trends and to learn about different trading strategies and techniques. If you click on the academy section of the Binary.com website, you will be taken to a news section that will show you current happenings within the platform. This could include updates and new products that you the trader have access to. From there, you can look at a daily report, video. as well as contributors. The academy section of the website provides you with a healthy amount of material. From there, you can go to the learning center of the website which includes “The Commodities Corner” as well webinars and weekly trading signals. It also appears there are EBooks that you can have access to as well. Knowing that you have access to these materials is crucial because if you are going to invest time and energy into a platform, they should invest time and energy back into you. Opening a demo account appears fairly simple. As you enter the home page, there is a line where you can enter your email and select “Create Free Account” or you have the option of creating an account with Google. From there, you can set up the demo account by providing the necessary information. This will allow you to test drive the platform and see if it fits your needs without risking your capital. Like many of the platforms out there, Binary.com has many different payment methods. Along with the variety of payment methods include their processing times. Under the payment methods section of their website, you can see the different bank wires, debit/credit cards, and even crypto currency methods of depositing funds into your account. The one common thread amongst all the different methods of depositing is that the withdraw period appears to only take one day to process, which is good for trades needing quick access to their funds. Other platforms can take up to five business days or more. It is important to go over the terms of service when opening an account. This document will tell you the different rules you will be bound to within the platform. For example, the governing bodies you will be under when trading on Binary.com include the Isle of Man, Malta, or Costa Rica. That being said, it may benefit you to have a general understanding of how their financial laws work. From there, you can see how security is handled, as well as conflicts and the risk disclaimer. Essentially everything you need to know will be in this section of the website from a legal standpoint. From this quick overview, it appears that Binary.com is one of the more well known and trusted brokers and platforms in the binary option industry. Offering not only binary options but MetaTrader 5 to their customers, you have a full range of investing possibilities. Understanding how these work is important before risking your capital, and you can do this by opening a demo account. Overall, it appears Binary.com knows what they are doing and have the awards and regulations to prove it. If you have ever had experience with this platform please leave a comment below describing your experience. Also, if you are new and have a question, leave a comment below for someone to answer. Binary.com appears to have been in the game for quite some time and offers many different trading, as well as deposit and withdraws methods for their clients. That’s enough from us, go take a test drive and see if it is the right fit for you. One wouldn’t really think much of this, all I really wanted to do was invest and be part of it but the way I was misled by this brokers was terrible, to easily take money from all in the name of investment and when I wanted to make withdrawals every single attempt was fruitless with constant hassle to invest more I really can’t say more than I have already said. 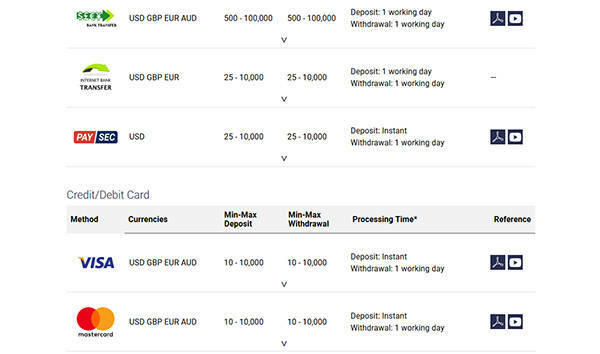 I would really consider myself to be one of the very few lucky ones as I was able to have my funds recovered from this scam Binary option brokers, although it was through unethical means as far I am concerned but what can I care after how my hard-earned funds where taken from me, these guys are the best in less than 7days all my funds including bonuses had been recovered, If your broker lost your funds trading Binary options wealthrecoverynow dot co are more than able to get your funds back without any traces. Best of luck people.